This baby wash & shampoo is the gentle-est. Its natural sweet scent will calm any baby. May also be used for those who prefer scent-free options! Great for the entire family! Most children have no issue if this gets into the eyes. This is NOT a "No Tears" formula. If you see those claims, it means the company has included a chemical numbing agent to numb the eyes so the baby cannot feel the irritation. This numbing agent is often not listed in the ingredients and can lead to eye damage! Very nourishing, no drying of the skin! I have been using this soap since my son was born, after I did HOURS and HOURS of research for safe products. 10 years later, I still love it! 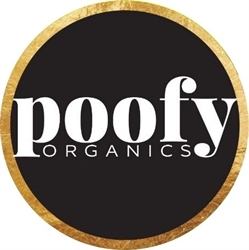 Thanks Poofy Organics! We were using another brand that claimed 99.9% natural and it just wasn’t cutting it for me. I love using this product on my toddler. It does a good job at cleaning her hair as she does get quite oily after 2 days. This was one of my first products purchased from Poofy and I absolutely LOVE it!! I use it for both my son and daughter! They both have long hair and this makes their hair so soft, their curls bouncy and I love the way it smells! :) We are now on our 2nd bottle and it's lasted us months! Even with me using it as well!! Hahaha! It's an amazing product and I love that I am able to use toxin free products on my babies! Thank you, Poofy! You've made one decision easier for this mama! Great for kids and makeup brushes! I use this very mild wash on my 2 young boys. Lathers surprisingly well. So well that I wash their hair and then use it as a body wash. Makes for a super quick bath for 2 moving targets! My son has crazy hair this stuff tamed it and keeps it tame I absolutely love it! Thank you poofy ! I use this shampoo for my special needs son and it works great. With just a few drops under the faucet we get a ton of bubbles and it lathers very nicely on his hair and body. I was a little nervous about there being no scent cause I love the smell of a clean kiddos, but it actually does have a very nice and clean natural scent to it. Because a little goes a long way I will be able to use this bottle for a long time! Very happy! This product is the best and last a long time for a peace of mind with no chemicals. I ordered this for my daughter's 3, 6 over a month ago still have half a bottle. Little goes a long way. Their hair is so soft and shiny. Washes well. I still use conditioner in their hair but I can see a difference for sure. Thank you poofy organics! This is the only product I have used in my three kiddos, ages 5, 3, and 1. It has a neutral smell, it cleanses well, and because of Poofy's commitment to truly nontoxic ingredients I'm 100% comfortable with it! It has accidentally gotten in their eyes and mouths and there was no crying! Also, a little goes a looooong way. I think one bottle lasts us 6-8 months on three kids. Highly recommend. In fact, I purchase this for every baby shower I go to and give it as a gift. My infant daughter has extremely sensitive skin. This is the only wash I feel comfortable using on her. It keeps her clean and never irritates her skin. I love this baby wash since it is so pure, I felt very comfortable using it on my newborn. It also works great and has the perfect amount of suds. My rep suggested putting it in a foamer bottle with some water and that has made it super easy to use and last a lot longer than I expected too, making it a great value! so gentle and smells good too. perfect for my baby's sensitive skin. The best baby wash out there. It brings out the natural curls in my daughter's hair and doesn't weigh it down! It is perfect for her sensitive skin. I love the smell as well! Everyone in my family uses this! I love this unscented baby wash. I've used Lafe, Dolphin Organics, and California Baby, and by far, this my favorite. Clean rinsing. Not over sudsy.